Go Green (or pink, blue and orange ) ! Our eco-friendly cutlery kits are ready to be taken on the go to replace one-use spoons, forks and chop sticks. 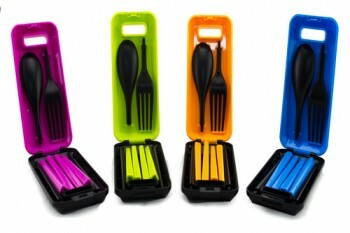 Easy-fit and sturdy construction ensures the cutlery stays intact during use, while still being easy to deconstruct and pack when finished.